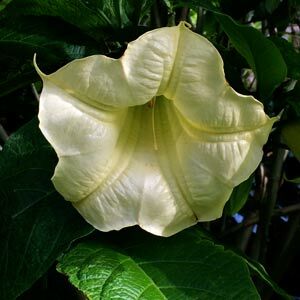 Brugmansia or ‘Angels trumpets’ are available from wholesale growers in an increasing number of flower colour and forms. Long flowering, easy to prune and with outstanding flowers, they make excellent background trees for medium to large gardens. Although they have been grown for many years it is only recently that dwarf varieties suited to container growing have become available. Growers and wholesalers have developed forms with a huge range of colours.The species are popular, however the hybrids do have larger and more colorful flowers. Brugmansia Varieties include cultivars with White, Yellow, Pink and Orange flowers. Growers also offer forms with double flowers as well as a number of species from the specialist wholesalers.